Kaori Suzuki started to study the classical ballet when she was a child at Singapore, then in Japan. 1989~1996, she had been working as a classical solo dancer in Japan, and since 1997, she lives in Paris and she has danced at Royal Ballet of London, Opera de Paris, Garnier and Bastille. 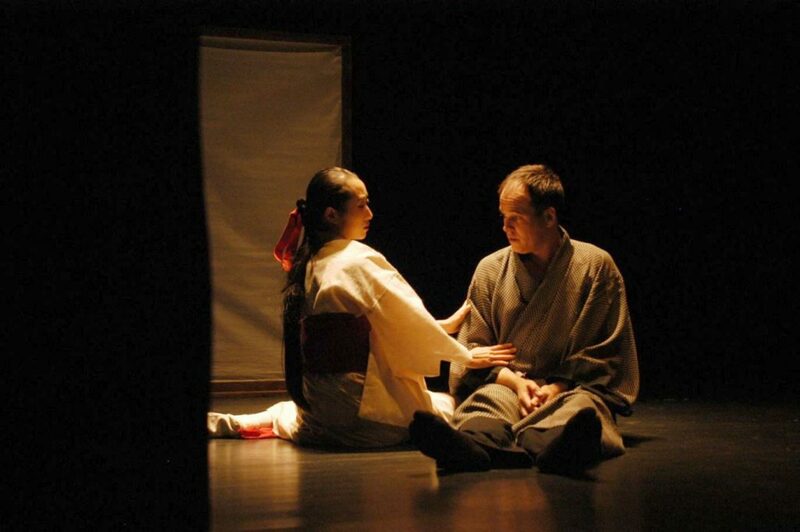 Kaori has played in the musical “King and me” with famous actor Lambert Wilson in Paris. Madame Suzuki is a very successful actress and a choreographer as well. Sébastien Vuillot started by Jazz Dance in 1985 then contemporary, tap dancing. He discovered Japanese traditional dances, as Nô, Kyogen in Japan and he has studied it there. In 2002, he met Christian Remer, Alain Recoing (master of the marionette) and at Théâtre aux Mains Nues (Paris) he has been working as his assistant. He received 1st Prize of Dance Box with his solo “Ningyo”. Sébastien Vuillot has played in several films: Ballon Rouge, M’as-tu rêvé ?, Bunraku. He also organizes The Festival de Marionettes in Paris. At the 14th edition of Le Petit Festival du Theatre they will play Kagome. The play refers to Japanese legend Tsuruno Ongaeshi. Finally, after seven days, the sound of the loom stopped and his wife, who had become very thin, stepped out of the room holding the most beautiful cloth he had ever seen. “Take this cloth to the marketplace and it will sell for a high price” said the wife.